Don’t forget to enter the lucky draw at the end of this post, you might win a FREE Premium License! CommentLuv Premium is the brain child of Andy Bailey and I am sure most of you either use this plugin or at least have heard of it. Andy knew he could improve upon the free version but would need some beta testers to try out this new plugin before he released it to the public. I immediately signed up since I loved the free one and I was eager to take it for a test drive. Because I have been using this plugin for all these years and I still love it to death, Kumar asked me if I wouldn’t mind sharing with his readers why I think this is absolutely the best plugin around and what you might not know about what it can do. If you have a WordPress blog and are using CommentLuv then people want to comment on your blog to get a dofollow link. One of Google’s 200 requirements for ranking your site are building backlinks. 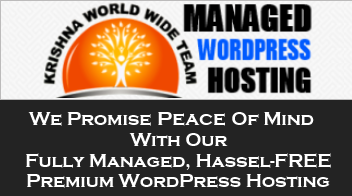 Have you noticed a sudden increase in the number of hosting companies offering managed WordPress hosting service? Last week, I was approached by two of my good friends asking me to recommend a reliable WordPress hosting company. Since they were just getting started, I recommended BlueHost to them as a good option for beginners. If you check into your Google Analytics, chances are that your About page (if you have one) is among the top 5 most visited pages on your website. Especially, for your first time visitors, it is the most important page. Any new visitor who lands on one of your pages through organic search or any social media channels, it is the About page that they visit next if they like your content. I have talked about it in the past and I want to talk about it one more time. This time, I want to talk about it in detail because as I was doing analysis of my conversion rate yesterday, I found something very interesting. Did you know that hackers may be trying to consume your server bandwidth and CPU resources at this very moment if you have a WordPress powered website? Do you have any mechanism to know that someone is trying to get into your website? Do you have any protection mechanism enabled? A large botnet of more than 90,000 compromised servers has been attempting to break into WordPress websites (randomly) by continually trying to get into the WordPress admin dashboard using the default “admin” username and guessing passwords. Starting your own website doesn’t seem to be rocket science and, it’s not. But, having a plan in place to launch, knowing exactly what to do before and after the launch is very important for your success. I have often wondered, and I have seen many of my friends beating around the bushes to find success after starting a new website. Sometimes, I have ended up making the same mistakes a second and a third time. If you have launched a website or are planning to, you know what I’m talking about. With MisterAcronym.com website design and development in full swing, I am again thinking to revisit my launch plan of this website with my partner, Bill Butler. MisterAcronym.com is a creative project with the intention to entertain and educate, while helping our readers expand their vocabulary in English language in a very creative manner.